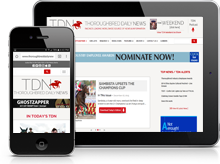 To view the TDN Media Kit, with pricing, examples, demographics and other detailed information – click here. Please call the TDN Advertising Staff at (732) 747-8060 for pricing and availability. A PDF copy of this ad schedule is available for print-out by clicking here. 1. Payment is due within 30 days of date of invoice. A 1.5% per month carrying charge will be added to delinquent accounts. In the event the account is turned over to an attorney or collection agency for collection, the reasonable cost of collection will be charged to the advertiser and the advertising agency, including without limitation attorney’s fees, collection agency fees, and court costs. Advertiser and advertising agency consent to the personal jurisdiction of the courts of the State of New Jersey in the event an action to collect a delinquent account is brought. 2. Insertion orders must specifically state magazine, issue(s) and space to be used. TDN will not be bound by any conditions appearing on or accompanying insertion orders, or copy instructions when such conditions conflict with or supplement the terms and conditions set forth herein and in the rate card, unless specifically agreed to in writing by TDN. 3. All advertisements are published upon the understanding that the advertiser and the advertising agency (if any) assume full and complete responsibility and liability for the content of all advertisements submitted for publication. Advertiser and the advertising agency warrant that all advertisements comply with all applicable federal and state laws and regulations. The advertiser and the advertising agency each represent and warrant that the advertisements will not contain any matter that is false, deceptive, misleading, obscene, disparaging or libelous, or that violates any person’s right of privacy or publicity, or infringes on any copyright, trademark or confidentiality right. TDN is not responsible for errors in typesetting or otherwise done by TDN. The advertiser and the advertising agency each agree to indemnify and hold harmless TDN and its employees and representatives from any and all loss, expense, or other liability, including attorney’s fees, arising from any claims based on a breach or alleged breach of the foregoing representations and warranties. 4. TDN reserves the right, in its sole discretion and without liability, to reject any advertising order for any reason at any time with or without notice to the advertiser or advertising agency, and regardless whether such advertising was previously accepted or published. TDN may, in its sole discretion, alter or reject any advertisement that contravenes its policies or that in its opinion is or may be false, misleading, disparaging, or may expose TDN to any claim or liability. TDN’s failure to exercise this right shall not relieve advertiser and advertising agency of their warranties and obligations under paragraph 3 above. 5. In the event an order is placed by an agency on behalf of the advertiser, such agency warrants and represents that it has full right and authority to place such order on behalf of the advertiser. The advertiser and its agency each agrees to be jointly and severally liable for TDN’s charge for each advertisement placed. Thus, TDN may recover its advertising charges from either the advertiser or the agency, regardless of the relationship between the advertiser and the agency and without regard to any contrary provision in any insertion order, purchase order, or other document. 7. Only FDA approved medications may be advertised in the TDN .